Prof. Alfons Weersink, Department of Food, Agricultural and Resource Economics (FARE), was named a fellow of the Canadian Agricultural Economics Society (CAES) on May 31. Criteria for the honour include significant contributions to the agricultural economics profession and the institutions of Canadian agricultural economics. Weersink has been at the University of Guelph since completing his PhD at Cornell University in 1989. He was a visiting scholar at the Food Research Institute, Stanford University, in 1995-1996; a Henry Schapper Fellow at the School of Agriculture and Resource Economics, University of Western Australia, in 2004; and a Mansholt Graduate School Fellow at Wagningen University in 2010-2011. In addition, he has been an adjunct professor at the School of Agriculture and Resource Economics, University of Western Australia, since 2010. Among other things, Weersink’s research examines the effectiveness of agri-environmental policies. He has won several awards for his work, including recognition for outstanding articles in the Canadian Journal of Agricultural Economics and the Review of Agricultural Economics. He received the OAC Alumni Foundation Distinguished Research Award in 2006 and, more recently, honours from CAES and the Australian Agricultural and Resource Economics Society. Of special note, says Ker, is that much of Weersink’s research has been done in conjunction with graduate students. “Alfons has supervised 10 PhD students and 36 master’s students. Most impressively, almost all of these students have produced a publication in a refereed academic journal. 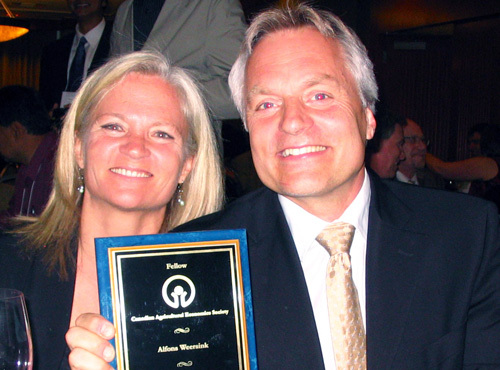 Prof. Alfons Weersink and his wife, Maureen, at the Canadian Agricultural Economics Society awards banquet.